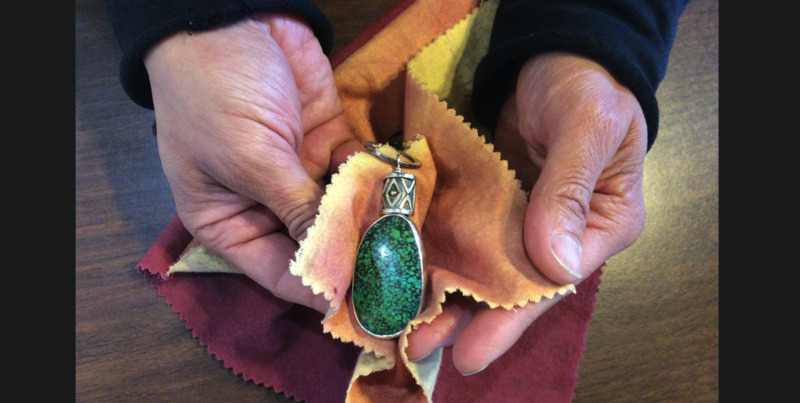 Our Gallery Director Giancarlo polishing a silver, gold and Tibetan Turquoise pendant using a simple polishing cloth. The various ways of cleaning jewelry depends upon the piece itself, due to the metal and gems involved with the piece. The issues related to cleaning an engagement ring gem are different from those involved in a piece of jewelry made of silver without a gem, for example. A two tone, gold and silver, piece of jewelry can have slightly different issues than a two tone solid gold ring. What Causes Tarnishing and Corrosion? Sterling silver is made of silver and alloys. It’s 7.5% other metals, usually copper, and 92.5% silver. Naturally, copper reacts primarily to sulphur in the air, which makes silver tarnish. The copper in silver can react to humidity, pollution and surprisingly contact with cosmetics. Even sweat, which contains fats and fatty acids, can cause tarnishing. Interestingly enough, the use of antibiotics can change the quality of perspiration therefore resulting in even greater tarnishing, making cleaning silver jewelry quite the chore. Cleaning gold jewelry is not as necessary as cleaning silver jewelry. Pure 24K gold will not tarnish, but pure gold is too soft for most jewelry. Gold is alloyed, usually with copper, silver and zinc, in order to make it harder: 18K gold is 18/24th gold; 14K is 14/24ths gold. Base metals in gold can corrode, particularly under wet conditions, such as humidity and perspiration. But the gold itself will stay gold in color, but the alloys may corrode. Cleaning our two tone gold over silver items, particularly our earrings, pendants and bracelets are generally pretty easy. With this jewelry, we intentionally oxidize (antique) our jewelry to create a greater contrast with our detailed designs. All you need is a polishing cloth and rub it against the surface. The gold stays gold and the silver stays dark. The same is true with two tone gold over silver wedding bands. It is important to not use a cleaning solution because the liquid will remove all the antiquing, impacting the visual quality of the design. With cleaning sterling silver jewelry, the same policy applies. Rubbing the piece with a polishing cloth is sufficient and will usually make the piece as good as new. Cleaning our two tone gold over gold designs will also polishing up nicely simply with a polishing cloth. In some cases, we antique the background of the ring itself. But this antiquing of gold is not the same as silver. It’s done with lacquer and enameled on. With engagement rings, often the gemstone gets dirty and looks dull. What we recommend is to put the piece in a sonic, a tool that cleans through vibration and gets the dirt off the gem. The small melee gems inset in a ring can also become dulled over time. It’s possible to purchase a small sonic cleaner for the home, but many jewelers, including us, will do this for you, free of any service charge. Diamonds, sapphires, emeralds and most colored gemstones are safe in the sonic. Opals, however, can be damaged. At Reflective Jewelry, we will always clean your jewelry purchased from us at no charge. Because we have polishing wheels, we can in almost all cases remove scratches and bring your jewelry up to a brand new appearance. We are located at 912 Baca Street, Santa Fe, New Mexico 87505.